Sandfield Macdonald was born in St. Raphael, Glengarry County, Upper Canada. His father, Alexander Macdonald, was a Roman Catholic Highlander from the Clan Ranald whose extended family had immigrated to Upper Canada in 1786 when he was still a child. Alexander married Nancy Macdonald, a distant cousin, and had John Sandfield soon after. Nancy bore four more children before passing away in 1820. Motherless at the tender age of eight, Sandfield "developed the independent and undisciplined character that marked his future political career as an 'Ishmaelite,'" despite his father's vigorous attempts at disciplining him. 1 Sandfield attempted to run away from home twice before turning eleven; the second time, his father caught him at Cornwall while the youngster was negotiating with a native to take him across the river via canoe. Uneasy within the confines of his school, Sandfield took his first job as a clerk in a general store in Lancaster at the age of sixteen. After spending several years in this capacity, Sandfield became discontented and longed for a more fulfilling future. Deciding to pursue a legal career, he enrolled in the Eastern District grammar school in Cornwall, which was under the supervision of the Church of Scotland, in 1832. He graduated three years later at the head of his class and articled with one of Cornwall's leading Tory politicians, Archibald McLean. 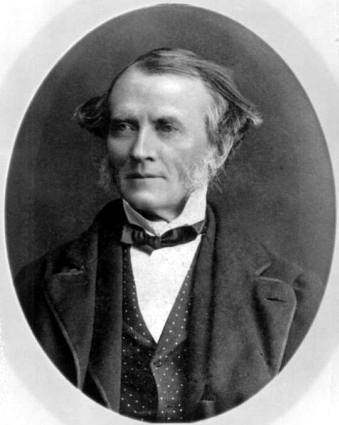 When McClean was promoted to the Court of the King's Bench in 1837, he made Sandfield his assistant on the western circuit. This position put Sandfield in contact with the leading men of the day, such as Allan MacNab and Thomas Talbot. Sandfield was also commissioned as queen's messenger, whose responsibilities included carrying dispatches between the Lieutenant Governor in Toronto and the British minister in Washington, D.C. On one of these journeys he met Marie Christine Waggaman, the daughter of a former Whig senator from the Louisiana aristocracy. Several months after opening his own law practice in Cornwall in 1840, Sandfield and Waggaman eloped in New York City. Over the years, they would be blessed with six children. The following year, Glengarry's two leading politicians asked Sandfield to stand for election to the first Legislative Assembly of the united Province of Canada. These men, Colonel Alexander Fraser and John McGillivray, held such sway over the county that Sandfield swept the election without delivering a single political address. His support of the new Reform government of Robert Baldwin, Louis-Hippolyte La Fontaine, and Augustin Morin, however, helped him to secure his high-profile social and political positions in Glengarry. When the Reform ministers resigned in 1846, Sandfield went into opposition and relabeled himself a Reformer. Joining Baldwin's crusade for responsible government, he took on the political identity he would assume for the rest of his life. 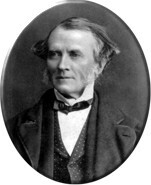 Sandfield's influence spread as popular opinion began to favour Reform. He greatly enjoyed the extended patronage of the La Fontaine-Baldwin ministry after it formed in 1848, and his followers swept Glengarry's local municipal elections in 1850. Once the Province of Canada had secured responsible government, however, the Reform party's power began to subside. 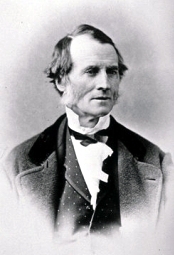 Francis Hincks took over when La Fontaine and Baldwin resigned in 1851, and Sandfield expected to succeed Baldwin as Attorney General for Canada West. But Hincks, who bore a personal distaste for Sandfield, decided it was more important to regain Clear Grit support, and selected William Buell Richards instead. Sandfield resigned his position as Solicitor General in protest, never forgiving Hincks for turning him, as he said, "out to pasture like an old horse." Despite Sandfield's stance as an independent Reformer, he held a considerable following in the Legislative Assembly from the eastern counties of Upper Canada. To placate Sandfield, Hincks offered him the speakership of the assembly. Although he accepted, he later regretted that the position made it impossible for him to voice the dissatisfaction his constituents maintained with the government's support of sectarian colleges, clergy reserves, and other items of denominational privilege. The Protestants and Roman Catholics of Glengarry enjoyed a friendly relationship, and Sandfield himself held a highly secular attitude towards church and state relations. Although the speakership was a burden for Sandfield, it provided him with one of his greatest political moments. After defeat in the Speech from the Throne debate at the opening of the 1854 session of parliament, the government did not resign; instead of calling for a new ministry, Governor-General Lord Elgin dissolved the House of Commons. Before Lord Elgin could read the session's closing address, an irate Sandfield questioned the constitutionality of his actions. The Governor-General acquiesced and dissolved the government, and Sandfield became a popular hero overnight, the constitution's defender against tyranny. Glengarry returned him to his seat in the assembly by acclamation, and George Brown pledged to support any government Sandfield formed if it was dedicated to the separation of church and state and representation by population. This, however, was an impossible proposition for Sandfield to accept, as he was dedicated to the dual nature of the united province and considerate of the wishes of Lower Canada's majority. Their relationship further deteriorated when Sandfield, as leader of the opposition, refused to support Brown's policies and instead endorsed the principle of the double majority, which meant that bills needed the support of the majority of MPs from both Canada East and Canada West in order to be passed. After Brown's "double shuffle" episode in August 1858, Sandfield became convinced that the Clear Grit's impatience had crippled the Reform movement. The Glengarrian did not believe that a Lower Canadian majority would ever accept Brown, whose efforts only disrupted the Reform movement and hindered it from obtaining office. Brown thus consolidated his battle station for representation by population in Toronto while Sandfield remained a staunch supporter of the dual majority with his comrades in Lower Canada and the eastern counties. He attempted to overthrow Brown as leader of Upper Canadian Reform in 1860, arguing that the party had to avoid taking sectarian, doctrinaire stances in order to be viable. The problem of the union, he said, was not the constitution but agitators from the southwestern peninsula. Reform disunity helped the Conservatives in the 1861 elections; Brown suffered personal defeat, and his monopoly on representation by population was shattered when some of his opponents adopted the program. When the MacDonald-Cartier government was defeated in May 1862 over a militia bill, Governor-General Lord Monck summoned Sandfield to take the office of Premier of Canada West. Although Sandfield Macdonald's government faced harsh sectional and sectarian differences while the American Civil War threatened border security, he had reason to be optimistic. Internal divisions were waning, administration was smooth, and the volunteer militia had mustered a force of twenty-five thousand men. Despite the prevalence of internal power games, plans for fiscal and administrative reform matured, the militia was reorganized, and an unprecedented audit bill was drafted to grant the legislature scrutiny over departmental expenditures. Soon, however, it became apparent that Canada had reached an impasse, with political deadlocks proving irreconcilable in the unstable coalition governments. Sandfield considered federalism to be prodigal and divisive, and remained on the sideline for the next three years while the Great Coalition led Canada towards confederation. Still harbouring the view that the problem was with politicians and not the system, he nevertheless accepted the reality of confederation after the Quebec conference of 1865. He spent the next year attempting to nudge his principles into the proposed Ontario constitution, accepting the supervision of provincial legislation but rejecting the prohibition of provincial tampering with separate schools as a violation of the responsible government principle. After Brown left the coalition, John. 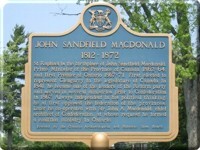 A. MacDonald found an ally in Sandfield and helped maneuver him into Ontario's first premiership. Sandfield was also awarded the position of Attorney General in MacDonald's first cabinet as Prime Minister of the Dominion of Canada. 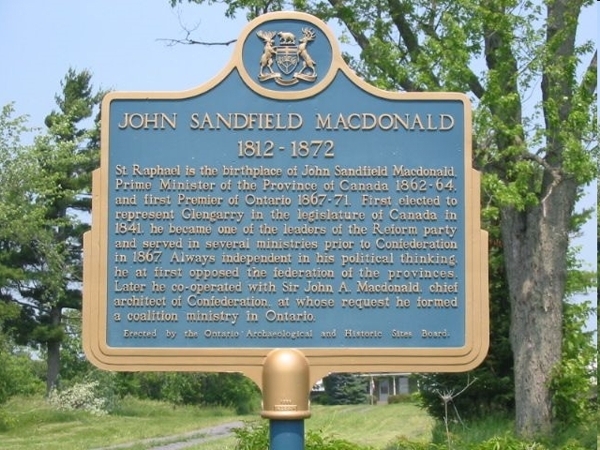 Sandfield opened Ontario's first legislature on 27 December 1867. The greatest achievement of the session was the passing of the Homestead Act, which provided free land for homesteaders on the surveyed Crown lands of Muskoka, Haliburton, and north Hastings. Over the next three years, northern development was extended to include railway construction, mining, forestry, and settlement. He also tackled education reform, struggling to reorganize the primary and secondary school systems by introducing free, compulsory schooling, standardized teaching qualifications, and financial contribution from municipalities. (The Liberal opposition fought the bill's centralizing and compulsory features so vehemently that it was not passed until 1871.) The government also established the Ontario School of Agriculture (now the University of Guelph) in 1874 and the Ryerson Poly-technical Institute. Sandfield's election reform bill of 1868 considerably expanded the franchise by eliminating certain property requirements and mandated that elections be held on the same day throughout the province. He also passed important legislation enabling long-overdue prison and hospital inspection and reform while establishing an asylum in London and institutions for the deaf, mute, and blind in Belleville and Brantford. But substantial as Sandfield's reforms were, they failed to capture the Ontario voters. The political game itself provided his ultimate undoing. Vulnerable from the candid way he used the patronage system (which he believed to be an essential element of responsible government), he emphasized the role of the provincial cabinet and had the legislature vote only for vaguely appropriated sums of money for government expenditure. The Clear Grits jumped on the chance to bring him down when the legislature voted to put the 1871 $1.5 million provincial budget surplus into northern railway extension, even though it has never been proven that the money was improperly expended. While the Grits were crusading for the defense of Ontario rights, Sandfield's campaign efforts that spring were curtailed by his faltering health. Already having suffered a collapsed lung in 1862 from a bout of tuberculosis, he spent most of the campaign in bed with high fever and rheumatic pains. But election results were inconclusive: although the Grits had swept most of the western peninsula, they failed to capture a clear majority. Sandfield was thus determined to meet the legislature even if he had "to be carried there in a blanket." One of his own election reforms had removed decisions on electoral irregularities from partisan committees of the legislature and gave them to the courts. It had also stated that the MP whose election was under investigation could not take his seat while the courts were reviewing his case. Under these stern provisions, by-elections were necessary, but they could not be called until parliament opened in December. With so many vacancies in the legislature, Sandfield claimed that a non-confidence vote could not overthrow his government, but the Liberal opposition leader, Edward Blake, still moved to motion. He chose the issue of the railway appropriation, even though the former legislature, rather than the cabinet, had been responsible for it. The motion carried by seven votes. Sandfield refused to resign, but his cabinet's sole Grit coalitionist, Edmund Burke Wood, allied with Blake, as did speaker R. W. Scott. As Sandfield's supporters drifted away, so too did all efforts at compromise. On 19 February 1872 he announced the resignation of his government and stepped down for Blake. Poor health prevented Sandfield from acting as leader of the opposition. Confined to his bed that March, he lingered with a "displaced and impaired" heart before passing away on 1 June. His gravesite in St. Andrews Cemetery in St. Andrews West is marked by a bronze plaque that was erected by the Ontario Heritage Trust in 2007. He was survived in the House of Commons by his brothers Donald Alexander Macdonald, who served as Liberal Member of Parliament for Glengarry from 1867 until 1875, and Alexander Francis Macdonald, who was the Liberal MP for Cornwall from 1874 to 1878. Donald left the legislature to serve as Lieutenant-Governor of Ontario, a post he held until 1880. After Sandfield's tenure, the sectarian tension he had worked to quell rose in the province. The Conservatives increasingly identified themselves with the Orange Order and sectarian Protestantism. Orange Ontarians became a core constituency of the party that its leaders were loathe to neglect. Sandfield would be the only Roman Catholic Premier of Ontario until Dalton McGuinty assumed office in 2003.